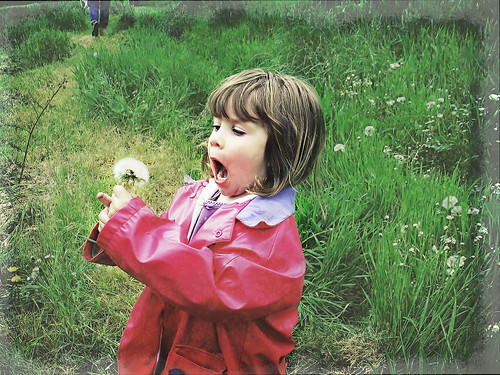 dandelion girl, originally uploaded by jahansell. Party just to give a taste of spring, which is in the air today (right now there's even a bit of sunshine!) and in part to share a new discovery in the world of photography - Photoshop actions. People use these shortcuts in post-processing to get various interesting effects - vintage, gritty, faded, etc - there are hundreds of them out there for free download and hundreds more that can be bought. For me, the goal in trying them is to learn more Photoshop skills - in figuring out how they were written I can expand my own knowledge of the many powerful tools available in Photoshop. This was a sweet picture right out of the camera, but it's got all kinds of filters and textures added now ... kind of nice! Beautiful photo, one for the family album. I have fairly struggled with photoshop but I am at last making progress.